For your convenience, you can purchase tickets to all events at the Fraze Pavilion Ticket Office (on show dates), Fraze FanFare Store located in Town & Country Shopping Center, www.fraze.com, www.etix.com or Charge-by-Phone at 1-800-514-3849. Additional information about these ordering options is found below. Please note that there can be no ticket refunds or exchanges even in the event of inclement weather. All performances are subject to postponement, delay or cancellations due to rain or severe weather conditions. In the event of inclement weather, an announcement will be made on stage by the Fraze Pavilion General Manager prior to or during a performance. DOES MY INFANT BABY NEED A TICKET? Yes, children of all ages must have a ticket for Fraze events. For reserved seat shows, children under the age of 5 may not sit in Plaza or Orchestra seating and are welcome to sit in the Lawn or Terrace sections. Strollers are not allowed in Fraze Pavilion for any ticketed event. If your tickets have been lost or stolen or your tickets were never received in the mail, please contact the original point of purchase for assistance. DOES FRAZE PAVILION HAVE A BAG SIZE POLICY? YES. 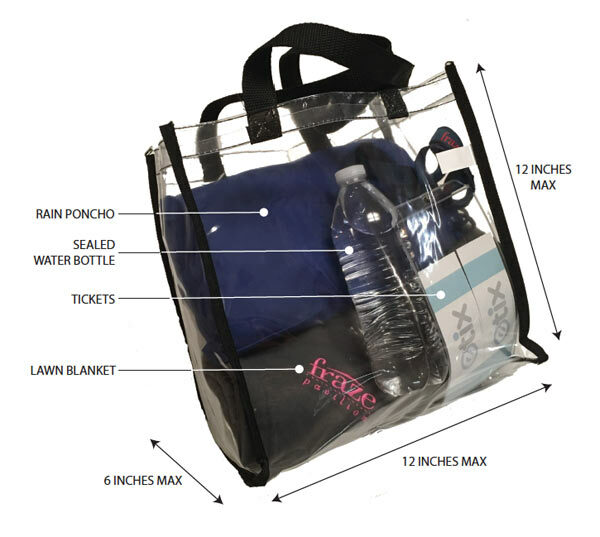 Bag/purse/tote size is limited to 12″x12″x6″. 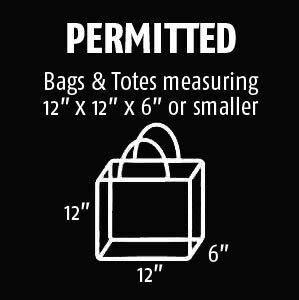 Any bag/purse/tote in excess of 12″x12″x6″ must be returned to vehicle and will not be item checked. 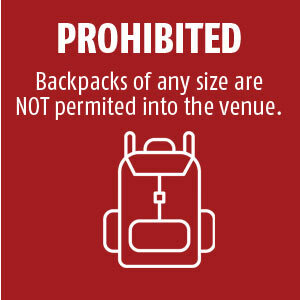 All Backpacks prohibited. See information below. Artists and programs subject to change without notice. Due to anticipated volume of first day ticket sales, faxed orders received on or before first day of sales may not be filled until the following Monday. Orders will automatically be filled with tickets in the next lower price category. Open show days from 3:00 PM to intermission. No service fee is charged to tickets purchased at the Fraze Pavilion Ticket Office or the Fraze FanFare store. We accept cash, Visa, MasterCard and Discover credit cards at both locations. Personal checks are NOT accepted. Etix is a source for tickets to all events at the Fraze Pavilion. Phone and online orders accept Visa, MasterCard and Discover only. A service fee will be added to the price of the tickets when purchased online or charged by phone. Please note, tickets that are being held in will call are available for pick up AFTER 3 pm on day of show at the Fraze Pavilion ticket office only, located in Lincoln Park. The person purchasing the tickets must be present and show picture I.D., the credit card used for making the purchase and the confirmation number. Free parking is available at select lots around the facility. Parking is not guaranteed. You may also park on surrounding side streets, where permitted. Please allow sufficient time to park, walk to venue and enter gates.